Lingerie brand Agent Provocateur will launch Fatale Intense, a new fragrance for women. Fatale Intense is a flanker to 2014's Fatale. The notes include licorice, spicy chili, lotus blossom, black leather, vanilla and amber. 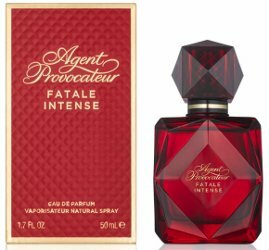 Agent Provocateur Fatale Intense will debut in June, in 30 and 50 ml Eau de Parfum. It’s much nicer in red. Still like the old opaque teardrop bottle better (and that would have been stunning in red). Everything about this sounds good. Will test this. Agree, bottle is much better in red:). Notes sound fun, so long as “lotus” doesn’t mean “very watery”. Totally agree with that. Maybe not everything sounds good! Licorice, leather, chili and amber make my mouth water some. Watch, it will be all about the vanilla and lotus, meh. lol. Will see. Chili? As in chili pepper or as in Campbell’s Chunky Soups? ?